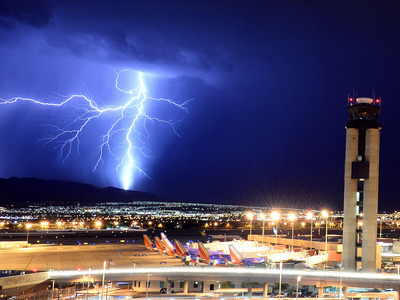 Ethan Miller/Getty ImagesLightning flashes behind an air traffic control tower at McCarran International Airport on August 18, 2013 in Las Vegas, Nevada. It could get ugly in the US economy before long. 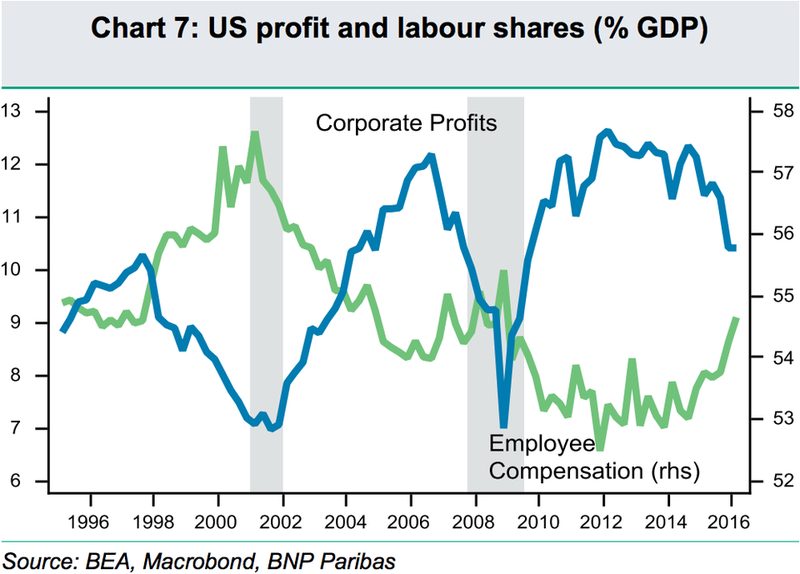 While everyone has been distracted by the strong labour market and the decent consumption, the real breakdown in the US economy has been coming from the corporate sector, argues Paul Mortimer-Lee of BNP Paribas in a note entitled “US Growth: Storm Brewing?”. “Why have so many, including the Fed, not seen the risks that now appear all too concrete?” asked Mortimer-Lee, chief US economist at BNP. According to Mortimer-Lee the drop in profits in the corporate sector typically presages a recession. 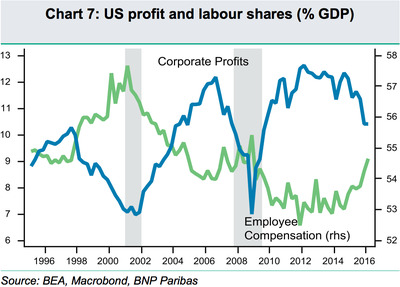 In this case, the stagnant inflation has reflected an inability of US companies to increase prices to the level necessary to maintain profits while labour costs have been rising. Said another way, companies are paying employees more, and they can’t hike prices to keep up with the rising cost. Thus, profits fall. This increase, according to Mortimer-Lee is strikingly like the lead-in to the 2001 recession which was preceded by a drop in corporate profits as well. “We believe that in an economy with a significant profit-oriented private sector, the rate of profit and its dynamic is a key determinant of the business cycle,” said the note from Mortimer-Lee. The argument on this leading to a recession is one that we’ve noted before. Corporations respond to falling profits by cutting capital expenditures and investments in their business. If you’re not building new things, there is no need for new workers, so hiring slows and workers begin to conserve their income. Consumption falls and the whole thing tumbles down. Add in that the stock market stumbles last August and to start the year have made companies more wary of financial conditions and you’ve got a worrying number of clouds on the horizon. Thus, Mortimer-Lee projects that the risk of recession over the next 12 months is somewhere between 40% and 50%, depending on how terrible the incoming labour market data looks. This isn’t a majority, and thus not the most likely outcomes, but the likelihood is certainly spiking in an uncomfortable direction.